One of two earliest known maps engraved by Homann - long before he opened his own firm. Accuratissima Totius Africae Tabula in Lucem producta per Iacobum de Sandrart Norimbergae. 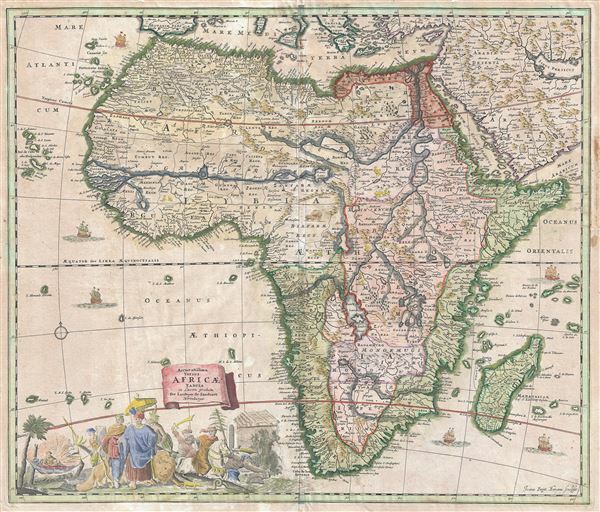 An uncommon map, this is Jacob Sandrart's 1697 map of Africa. The map covers the continent in full as well as the adjacent parts of Araba, Europe, and the Cape Verde and Canary Islands. The Prime Meridian runs through Ferro Island. Cartographically Sandrart has followed the DeWitt model of 1660. Both maps, as was standard during prior to explosion of African exploration in the 19th century, Sandrart relies heavily on Ptolemy to populate the interior - including rendering the speculative sources of the White Nile in two great inland lakes, Zaire Lacus and Zatlan Lac. The elaborate decorative cartouche in the lower left quadrant bears some attention. The cartographer intended the cartouche to illustrate the flora, fauna, and cultures of Africa - at least as they were perceived by Europeans of the period. The cartouches shows tribal leaders arrayed in opulent splendor while lounging on a lion with fat tailed sheep and Arabian steeds in the background. A hapless captive appears about to be beheaded in a river while and snakes and lizards abound. This is notably one of only two known maps engraved by Johann Baptiste Homann before 1700, thus very early in his career and some 12 years prior to founding his own legendary publishing house. Homann's imprint appears in the lower right quadrant. This map was never published in an atlas, but was rather sold separately and tipped into various composite atlases. Consequently it has been very difficult for scholars to date. Here we are following Betz, who date it c. 1697 to correspond with Sandrart's other work. Jacob von Sandrart (1630 - 1708) was a German publisher and artist active in Nuremburg in the late 17h century. Sandrart was born in Frankfurt-on-Main but relocated to the publishing center of Nuremberg to study painting under his uncle Joachim von Sandrart and engraving under notated cartographer Cornelius Danckerts. By 1656 he was one of the most responded portraitists and art dealers active in Nuremberg. Sandrart did not produce any known atlases, but he did publish a number of maps, most of which focused on Central Europe. Very good. Light toning. Minor older extension to right margin. Else clean. Platemark visible. Blank on verso. Betz, R., The Mapping of Africa A Cartobibliography of Printed Maps of the African Continent to 1700, #165. Norwich, O. I., Norwich's Maps of Africa: An Illustrated and Annotated Cartobibliography, #61. Afriterra, 768. OCLC 159834654, 54620077.